Now, more than ever, there’s a global call-to-action to press forward and progress gender parity, supported by this year’s International Women’s Day theme, #PressforProgress. While we know that gender parity won’t happen overnight, across the world women are making positive gains day by day – including women who have been empowered through, or influenced by, Australia Awards. One of these women is alumna Nibha Shrestha (featured) who has been drawing on her skills gained through her Australia Awards Scholarship to lead national and international-level advocacy initiatives in Nepal. Her recent achievements include preparing the Universal Periodic Review (UPR) report on behalf of the Non-Government Organisation (NGO) Coalition for submission to the United Nations. Shaana Farooq, Australia Awards alumna from the Maldives, started overseeing all of her country’s most significant infrastructure projects after completing her Australia Awards Scholarship. As a leading woman in the Maldives- male-dominated construction industry, Shaana inspires young women to work in the field of construction. 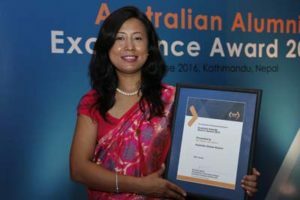 Rupananda Roy, Australia Awards alumna from the hill district Rangamati in Bangladesh, has pioneered in her achievements to date, including being the first ethnic woman in her country to have earned a PhD. Since its inception, the Australia Awards program in South and West Asia has grown in leaps and bounds to progress and promote gender equality and women’s empowerment. Since the program launched a regional Women in Leadership Network (WiLN) in 2015, functional chapters have been opening up in each of the program’s countries. The WiLN and its respective chapters provide a chance for alumna (female alumni) to connect across the region and support each other. The WiLN also helps promote Australia Awards opportunities to women and provides support and advice to prospective applicants. To mark International Women’s Day, the WiLN chapter for Sri Lanka will be launched today in Colombo. The event will bring together Australia Global Alumni – especially Australia Awards alumna – working across Sri Lanka’s private, public and non for profit sectors. A Mentorship Development Program, delivered by the WiLN chapter in Pakistan, took place this week drawing on messages from the United Nation’s own International Women’s Day theme for the year, “leave no woman behind”. The WiLN chapter in Bhutan will be meeting in Thimphu for International Women’s Day – to network, get to know each other better, and plan upcoming activities.